The Towner family were early Bronaugh residents living south of town near the county line. From History of Vernon County, Missouri. 1887, p. 782. (Farmer and Stock-raiser, Section 25, Post-office, Bronaugh). Down in the southeastern part of Harrison township and not far from the township line is located the farm of Mr. Towner, an exceptionally nice place of 320 acres, all under a high state of cultivation, the improvements of which will compare favorably with any in the country. That he is a thorough agriculturist has long since been found out. No one of inexperience or unacquainted with the details of farm life could meet with the success which has crowned his efforts. Indeed, on coming to this county he brought an experience of many years in agricultural pursuits, and practical, modern ideas which have proven of substantial results in all that he has undertaken. Thrift, earnest, persevering industry, has been a marked characteristic of all his operations, as the surroundings about his homestead ably testify. Like other citizens of the county Mr. Towner came originally from Delaware County, 0., where he was born August 18, 1828. Leonard Towner, his father, was a native of Pennsylvania, and when a young man he married Miss Julia A. Dewey, who subsequently bore him 14 children. Of this number our subject was the third child and second son. When eight years of age he accompanied his parents to LaSalle county, Ill., living there up to the year 1876, when a home was chosen in this county. Since then his interests have been identical with those of Vernon. He has since kept apace with her progress, and in fact has aided not a little in promoting her progress and development. In 1850 Mr. Towner was married to Miss Angelina Osborne, originally from Illinois. Their family numbers nine children, whose names are Ezra M., Alice, now Mrs. Stiles; Martha, now Mrs. James M. McKill; Gilead, William, Hiller, Jesse, Archie and Van. October 8, 1866 - July 28, 1907. Nathaniel Towner (above) appears in the 1860 census as a son of Leonard and Julia Towner in LaSalle County, Illinois. The marriage of two members of prominent Harrison Township families took place on December 19, 1883. Mr. Monroe McKill and Miss Mattie Towner were married by Rev. Mr. King. A newspaper report told that, "The wedding was very quiet, only a few relatives being present. Mr. McKill is a young man of sterling principles, good and true, and whom any young lady might have been proud to call husband. Miss Towner is a daughter of Mr. John Towner, one of Vernon County's prosperous farmers, and is a young lady who deserves a good husband. We congratulate her on her choice and throw after them the proverbial old shoe for luck, hoping it may follow them with our best wishes through life." N. H. Towner became ill one Sunday night and died within 24 hours. He was 67 years old and had lived in Vernon County for eighteen years. He was buried at Worsley Cemetery on July 5, 1898. The administrator's notice for the estate of Jesse L. Towner (left) was published on September 4, 1907. The administrator was Ezra M. Towner. Jesse had died July 28, 1907 and at the age of forty. He was buried at Worsley Cemetery. Jesse was a son of Nathaniel and Anglina Osborne Towner. The John and Prudence Towner grave marker is from Welborn Cemetery at Moundville. John Harvey Towner appears in the 1850 and 1860 census records as a son of Leonard and Julia Towner in LaSalle County, Illinois (so is a younger brother of Nathaniel Towner, above). By 1870, he was married to Prudence Swope but they still lived in Illinois. The census showed them with sons Harvey, age 3 and Hiram, age 2. Etsler Towner, age 13 also lived with them and was listed as a farm worker. By the 1875 Kansas Census and the 1880 federal census, they had moved west to Allen County, Kansas. The 1880 census included John H., age 38; Prudence, age 34; Harvey, age 12; Hiram F., age 10 and Clarence, age 4. There was an 1885 census in Kansas and the family was still listed as residents of Allen County. They also had a daughter, Lelia Etta, who was age 4. At some point after that, the family moved to Vernon County, Missouri. The first mention of any of the family being in Missouri was when Hiram Towner married Minnie Jones in Vernon County on February 4, 1892. She does not appear to be closely related to other Jones' in the Moundville area. The next mention of the family is when John H. Towner died in 1893. John is buried at Welborn Cemetery there. Prudence remained in Vernon County for a few years and daughter Lelia married James Alexander Means there on July 11, 1899. He was the son of Mr. and Mrs. Ben Means. The 1900 Vernon County Census shows Prudence living as a widow in Deerfield Township (which is where Welborn Cemetery is). With her is son Clarence, age 26, born Kansas; daughter Lelata (her first name has been spelled a variety of ways) Means, age 19 and also a widow; along with Viola Means who had been born in April 1900. So Lelia's marriage to James A. Means had been very short. 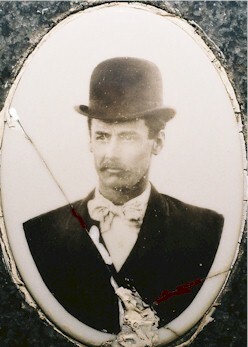 The Vernon County cemetery records show that James had died in 1899. So he died before his daughter was born. He was buried beside his father, B. F. Means and his sister Ida Means Singleton who died in 1902. The story gets even sadder when we see that Lelia Towner Means also died in 1900 - apparently later after the census was taken. She was buried beside her husband in Welborn Cemetery. By 1910, Prudence Towner was back in Allen County, Kansas where she lived with her son, Clarence and his family. Living with them was her granddaughter - who was 10 years old by then. The census refers to her as Verla Means, but there seems little doubt that this is the daughter of Lelia and James Means.